The beauty of the Gristleizer lies in the peculiarities of analogue circuit design. It’s a wild, quirky beast with bags of character. Quirky and full of aggressive character. Great fun for playing live. Labelling of some modules and controls is unusual. The Gristleizer was an effects box used by the band Throbbing Gristle built by their synth player Chris Carter in the late ’70s. 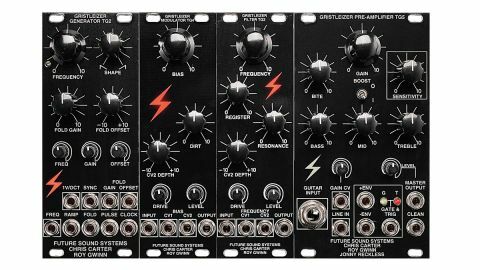 Now Finlay Shakespeare of Future Sound Systems has teamed up with Carter and original circuit designer Roy Gwinn to bring the Gristleizer up to date and into your Eurorack! As befits a modular version they break the unit down into its constituent parts and offer four separate modules. As the entry point to the system we looked at the TG5 preamp first. We spent some time with a cheap mic getting our Gristle on, moaning and barking through the effect. Great fun! We then turned to our 303 clone, the low signal level of which has always caused an issue within our modular environment. The preamp easily brought the acid box’s volume up to modular level but raised the general noise floor to an unacceptable level. Fortunately the preamp also features an envelope follower. Feeding the positive envelope to the TG4 VCA we used it as a noise gate, giving us a clean signal with no noise. We then flicked the gain boost switch and pushed the signal into distortion - tasty! This distortion can range from subtle warming to gritty to complete destruction. It sounded great on the 303 and also on the drum machine we fed through it. The TG5 also features a three-band EQ for sound shaping which we used to add a fat low-end boost, and a Bite control which accentuates the high frequencies and will really make your sound cut through the mix. Now let’s look at TG2 Generator. A simple LFO in the original design, the module version has increased stability and v/oct tracking. The oscillator has a wide frequency range so it can also be used as a bassline VCO. Other improvements include the ability to skew the Ramp output through Triangle to Saw, and a wave folder with three controls to shape sounds. As the Pulse output is derived from the Wavefold output the wavefold offset knob and CV in also produce a PWM effect on the Pulse output. TG3 Filter is a JFET controlled multi feedback band-pass filter. Unlike most Eurorack filter designs there is only one mode - you won’t be getting creamy low-pass out of this beast! We’d put this in the same bracket as the filters from the Polivoks and Wasp synths but it isn’t really like either of those; its quirks and charm are all its own. Register controls the resonant frequency of the filter core, while Frequency controls the gating of the transistor. Both of these controls are effectively doing the same thing but the way they affect the sound is quite different, with the JFET element introducing a lot of dirt and the resonant core being comparatively clean. The interplay between these two and the Resonance control provide a lot of interesting and unusual timbres. The TG3 operates quite differently to any other filter in my rack and you really need to play with it to reveal its charms. With the signal running hard through the transistor the audio itself will start to modulate the cutoff frequency producing two resonant peaks like a vowel filter. The original Gristleizer was an effects box built by Chris Carter of Throbbing Gristle, the avant-garde band who pioneered industrial music in the late ’70s. The unit was based on a design by a 16-year-old Roy Gwinn published in Practical Electronics magazine. Carter adapted the circuit, replacing the Bias trimpot with a front panel mounted control. The Gristleizer became a core part of the Throbbing Gristle sound, used on almost every element of the band’s output. Endangered Audio released a stomp box version in 2009 and later developed a single Eurorack module with CV inputs for many of the controls. TG4 Modulator is actually a VCA; again this is a JFET transistor-based design. Bias sets the level where the modulation begins with a CV input and attenuverter giving you full control over its operation. The Dirt control lets you dial in the desired amount of distortion. At zero you have a very clean signal, at 12 the module mimics the original Guitar Effects Pedal design. Past 12 you can completely destroy your signal. JFET distortion is known for adding second harmonics, a pleasing distortion similar to that of vacuum tube amps. At low levels it nicely rounds off the wave shapes of the TG2 and interacts nicely with the wavefolder particularly. Both the TG3 and the TG4 also have an input drive control to boost the input signal before it hits the rest of the circuitry and an output attenuator to help match the other levels in your system no matter how hard you’re pushing the distortion. While the TG3 and TG4 are ostensibly a VCF and VCA respectively, it’s perhaps better to view them both foremost as audio manipulation and mangling tools, and in this regard they certainly deliver the goods. As a gnarly synth voice the Gristleizer sounds fantastic. With the wavefolding and the wide ranging distortion available from pushing the VCA there are a lot of timbres to discover. At times it’s too extreme but there are a ton of sweet spots and the modules really reveal themselves when you put them through their paces. While each module could stand in its own right it’s their interactions as a group that we fell in love with. If we had to pick just one, in terms of value for money it’d be the TG4 VCA for its juicy distortion.